George Bonaventure, Thomas Cox, master. She left the Isle of Wight 4 May 1629, and probably reached Salem during the first half of July. Samuel Sharp and the Rev. Samuel Skelton were two of the passengers. Talbot, Thomas Beecher, master. This ship left London 25 April and the Isle of Wight 11 May, arriving at Cape Ann 27 June and Salem 29 June 1629. The Rev. Francis Higginson was one of the passengers. Lyon’s Whelp, John Gibbs, master. The Lyon’s Whelp sailed with the Talbot; the Rev. Francis Bright was a passenger. Pilgrim, William Woolrige, master. This ship sailed in August but “was seized off Canada by Captain Daniell of Dieppe who stripped her of her lading. On 31 October 1629 as she was returning to England she ran into foul weather off the Scilly isles and her masts and sails were cut down to save her.” The number of passengers on the Pilgrim is not known. At least eighteen vessels carrying passengers sailed from England for New England in 1630, not all of which were part of the Winthrop fleet. The Arbella is probably the most famous of this group, which sailed in late March from Cowes. John Winthrop recorded the arrival in Salem of four vessels which had set out together in late March: Arbella (on 12 June), Ambrose (13 June), Jewel (19 June), and Talbot (2 July). Seven other ships arrived during the course of the first week of July: Mayflower and Whale (1 July), Hopewell and William & Francis (3 July), Trial and Charles (5 July), and Success (6 July). 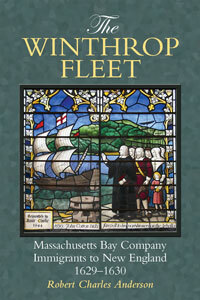 Finally, two other vessels – Gift and the Thomas & William – were financed by individual merchants associated with the Massachusetts Bay Company, and should be considered part of the Winthrop Fleet. So, too, perhaps, should the Handmaid, which arrived at Plymouth on 29 October with sixty passengers. One of the passengers on this vessel was John Eddy of Boxted, Essex, whose affiliations place him within the Massachusetts Bay Company’s orbit; this ship may have been the latest arrival of the Winthrop Fleet. Additional information on the merchant or financier behind this voyage would be useful. I would like to know more about the Mary and John too. Do you know where we can find the passenger lists of these ships? I’ve been looking for the ship which brought my immigrant ancestor over from England. I know it was some time after the Mayflower. His name was John Swett. Perhaps he spelled his last name as “Swete”. You can find John Swett/Sweet in volume 3 of The Great Migration Begins: Immigrants to New England 1620-1633. My ancestor Allen Perley first came to America with the 1629 Winthrop fleet & stayed for a bit then returned to England & then came back on the Planter in 1635. I am trying to find any info that marks his first visit. Is there a way to find the path as to how the Handmaid of 1630 came to the US from England? For instance did it stop anywhere during its voyage? I’m trying to find out how the Bryant’s came here.